Last week's defeat of minor premiers, Thistles, sent a resounding message to all of this year's Premier Division finalists. 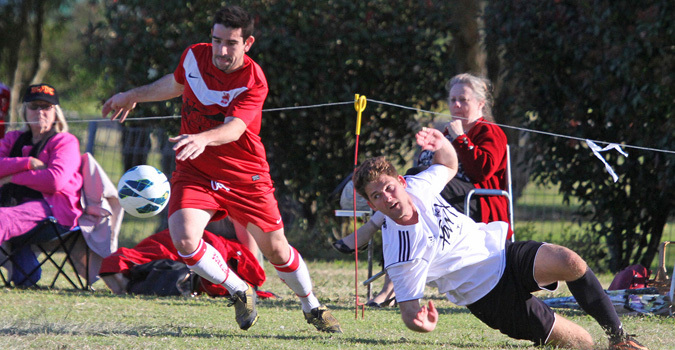 By contrast Saturday's clash with Lismore Workers was a quite subdued affair. A very lean squad took to the field in both grades. In fact, with so many players pulling double shifts, it was almost the same team in Prems and Reserves. Those that did play, however, gave it their all. In reserves, a dogged battle for the upper hand saw a lot of to and fro and opportunities for both sides going begging. Despite having the run of play for much of the game, the Reserves Rams just couldn't find the net. Final score was a disappointing 0-0. But enough to see the reserves go through to the Semis in third place. The Premier Reserves go to Alstonville on Friday night for their Semi Final. Kick off at 7.30pm. Again, lots of to and fro, with plenty of spirited attacking and stoic defence from both sides. After more than 2 hours of play for some, exhaustion began to tell, and Workers finally managed to take the match with a late goal. Entertaining football, but nothing to be drawn from the results. Herculean performances from the Rams, particularly the indefatigable Jonathan Pierce and brother Nolan, and the equally tireless Herick Schuenemann and Sam Owens.